What a simple and cleaver idea to brighten up your Easter dinner table leaving your guests in awe. These are made from raw dinner roll dough that can be purchased frozen or made from scratch. Kneed into a dome shape and snip two ears with scissors as shown in our picture above. Poke two holes for eyes and a hole for the nose with tip of shape knife. Coat with egg wash and bake. Make sure to get egg coating around ears and into eye and nose sockets – this prevents them from filling in as the dough rises. Creative and perfect for Easter – or anytime you want to make a child smile at the dinner table. 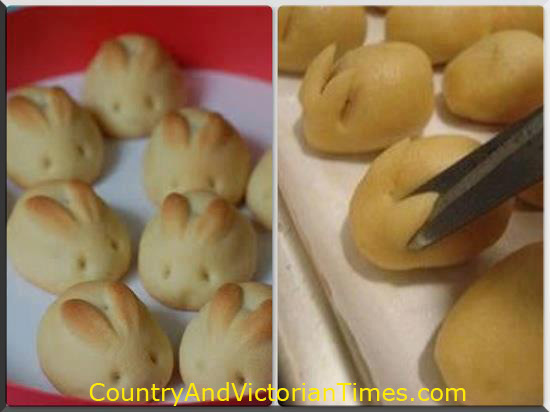 This entry was posted in Crafts ~ DIY ~ Projects, ~Easter, ~Edible, ~Food and tagged bunny, dinner, easter, fun, kid, kids, peter, rabbit, roll, setting, table, ~Food, ~Party. Bookmark the permalink.